Two young women are depicted crowning an athlete with alaurel wreath. St. George, patron Saint of England, slaying the dragon. 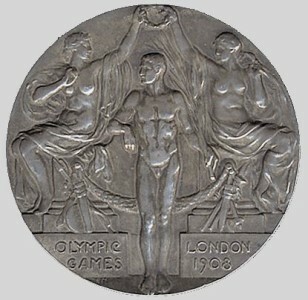 Two sets of Medals were providet, the first (in gold, silver, and bronze) for winners of first, second, and third prizes in Olympic events; the second (in silver-gilt, silver, bronze, and metal) were called Commemoration Medals, one being given to each competitor with his competitor`s badge, but the three higher classes being reserved for officials and other who did not compete. 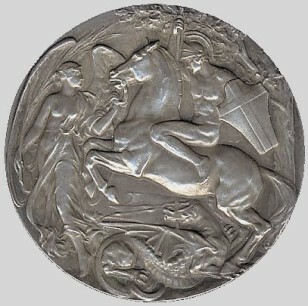 The Art Committee, to whom the organisation of prizes and awards was entrusted, was composed of Mr. T. A. Cook and Mr. G. S. Robertson (members of the British Olympic Council), who were fortunate enough to obtain, in the preliminary stages of their work, the valuable assistance and advice of Mr. Thomas Brock, R.A., and Mr. A. S. Cope, A.R.A. The commission for designing both kinds of medals was given to Mr. Bertram Mackennal, A.R.A., who also kindly gave the Council designs for the various official badges. The 250 gold medals ordered by the Concil were placed in red boxes, 260 silver in dark blue boxes, and 260 bronze in yellow boxes. the winnning team was awarded a gold medal and each of its members a silver medal. The second team was awarded a silver medal and each of its members a bronze medal. a gold medal to the helmsman of the winning team, silver medals to the crew. A silver medal to the helmsman of the team in second place an bronze medals für the crew. 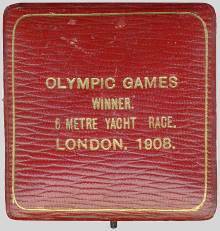 A commemorative medal, in gold, was also given to the owners of the winning yachts. Furthermore, in the 12 m and 15 m classes, a gold medal was given to the mate or the leading hand of the winning crew and a silver medal to the mate of the crew in second place. PRIZE-GIVING ON SATURDAY, JULY 25. I. All Awards except Gold Medals. to which he is entitled. handed to the official instructed to ask for it. cession allotted to prizes of that kind. Team Prizes will be taken by the Captain. Dark Blue Vouchers = Second Prize. Yellow Vouchers = Third Prize. Light Blue Vouchers = Diploma of Merit. Green Vouchers = Commemorative Medals. All winners of second and third prizes and of diplomas of merit, and all recipients of the special green cards for commemorative medals, will assemble on the east side of the Stadium, on the cycle track, opposite Block MM, and between Rooms 11 and 12. The Band of the Grenadier Guards will play the National Anthems of all the foreign countries represented. The Drums and Fifes of the Irish Guards will play the “Advance,” followed by a march. — Second-prize winners, holding dark-blue tickets, will advance between the dark-blue flags to the table of the same colour, at which Her Grace the Duchess of Rutland will distribute the silver medals, assisted by Mr. Sutherland, Mr. Fisher, and Mr. Boulger, members of the British Olympic Council, as her marshals. 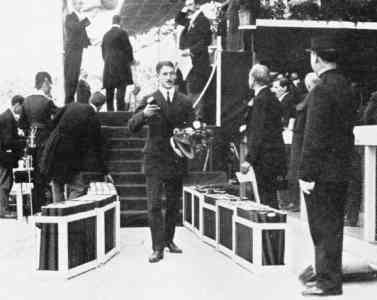 Third-prize winners, holding yellow tickets, will advance between the yellow flags to the table of the same colour, at which Katharine Duchess of Westminster will distribute the bronze medals, assisted by Mr. Syers, Mr. Biedermann, and Mr. Hawes, members of the British Olympic Council, as her marshals. Winners of diplomas of special merit will advance between the light- blue flags to the table of the same colour, at which the Duchess of Westminster will distribute the diplomas, assisted by Mr. Henry, Mr. Benjamin, and Mr. Richardson, members of the British Olympic Council, as her marshals. Recipients of the special commemorative medals will advance between the green flags to the table of the same colour, at which the Lady Desborough will distribute the medals, assisted by Mr. Blair, member of the British Olympic Council, and Mr. Vaughton, as her marshals. The Drums and Bugles of the Irish Guards will sound the “Advance” as each of these processions start. The Band of the Grenadier Guards will play the National Folk Songs during the first part of the prize-giving. II.—Gold Medals. Holders of Red Vouchers for First Prizes. When the National Anthem announcing the arrival of the Queen has begun, the winners of all first prizes will have been drawn up along the east side of the Stadium, opposite Block MM, on the concrete cycle track, between Rooms 11 and 12. Immediately the 1,600 Metre Relay Race is over, the Band of the Grenadier Guards will play “See, the Conquering Hero Comes!” and the procession of first-prize winners will form up on the two tracks and cross the grass to the south-west comer of the arena, and when the Drums and Bugles of the Irish Guards have sounded the “Advance,” they will advance to the platform on the cycle track, beneath the Royal Box, where they receive the gold medals from Her Majesty the Queen, who will be attended by Lord Desborough, the members of the International Olympic Committee, the members of the British Olympic Council, and others. 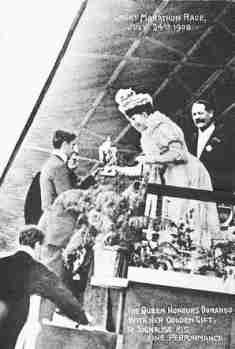 On descending from the platform in front of the Royal Box, the winners receive their diplomas from Mr. George C. Drinkwater, O.U.B.C., and Mr. C. K. Philips, O.U.B.C., acting as marshals, with a sprig of oak-leaves from Windsor Forest, graciously sent by His Majesty the King, which will be handed to them by Lieutenant Norman Leith Hay Clark, Lincolnshire Regiment, acting as marshal, each sprig being tied with the Union Jack. Her Majesty the Queen will then present her Gold Cup to Dorando Pietri. The Greek Trophy for the Marathon Race. The Prague Trophy for Gymnastics. The Montgomery Statuette for Discus. The Prince of Wales’ Cup for Cycling. The Hurlingham Club Trophy for Polo. The Gold and Silversmiths’ Cup for Wrestling. Lord Westbury’s Cup for Clay Bird Shooting. The British Fencers’ International Challenge Cup for Epée Teams. Winners of the Challenge Cups and Captains of the winning teams, accom- panied by their teams, will advance to receive their cups at the signal of three bugles from the Irish Guards. The Drums and Bugles of the Irish Guards will sound after the last cup has been given ; and prize-winners, having formed in line on the running- track in front of the Royal Box, will give three cheers for the Queen at a signal from Lord Desborough, after which the Band of the Grenadier Guards will play the National Anthem.